Now we're cooking with Gas! Thank you L2L for setting up this section. I invite all truthers to seek and list the evidence as we see it and let this be a record of the real issues affecting our climate as we experience it on Earth! Our history as a species (this is my opinion of course) is being influenced by forces yet unseen and therefore unknown by the general public and one of the reasons is the effects dealt by our Sun. The PTB's have had a change of heart and dropped the Global Warming theme to take up a new paradigm - Climate Change. I believe as the evidence has shown so far by our "honourable" mr. Gorypants - a Nobel Lauriat et al, that they will generate Profit from their ridiculous notion of taxing the people with their 'Carbon Tax' lies. Already well entrenched by levying tax on motor vehicle purchases as one example. We have no choice, as carbon fuels are not the energy solution that was chosen by the people, but foisted on us by the historical prohibition of Hemp more than a century ago. This was to break up self supporting settlements that were stable in their trade of barter in closed communities. It caused the small farmer to have to transport their produce across state borders to get their crops to markets that would be sustainable. The story is well documented in history! This will be both interesting and educational to prove that people are intelligent and can think for themselves! We all have the choice to exercise Free Will. A year ago tomorrow, just before the opening of the UN Copenhagen world climate summit, the British Meteorological Office issued a confident prediction. The mean world temperature for 2010, it announced, 'is expected to be 14.58C, the warmest on record' - a deeply worrying 0.58C above the 19611990 average. Last week, halfway through yet another giant, 15,000delegate UN climate jamboree, being held this time in the tropical splendour of Cancun in Mexico, the Met Office was at it again. Never mind that Britain, just as it was last winter and the winter before, was deep in the grip of a cold snap, which has seen some temperatures plummet to minus 20C, and that here 2010 has been the coolest year since 1996. Globally, it insisted, 2010 was still on course to be the warmest or second warmest year since current records began. But buried amid the details of those two Met Office statements 12 months apart lies a remarkable climbdown that has huge implications - not just for the Met Office, but for debate over climate change as a whole. Read carefully with other official data, they conceal a truth that for some, to paraphrase former US VicePresident Al Gore, is really inconvenient: for the past 15 years, global warming has stopped. What a load of Horse Sh*t and DOG V*M*T!! This one IS old but still Funneh IMHO!! From Miami to Maine, Savannah to Seattle, America is caught in an icy grip that one of the U.N.'s top global warming proponents says could mark the beginning of a mini ice age. Oranges are freezing and millions of tropical fish are dying in Florida, and it could be just the beginning of a decades-long deep freeze, says Professor Mojib Latif, one of the world's leading climate modelers. Latif thinks the cold snap Americans have been suffering through is only the beginning. He says we're in for 30 years of cooler temperatures -- a mini ice age, he calls it, basing his theory on an analysis of natural cycles in water temperatures in the world's oceans. Latif, a professor at the Leibniz Institute at Germany's Kiel University and an author of the U.N.'s Intergovernmental Panel on Climate Change (IPCC) report, believes the lengthy cold weather is merely a pause -- a 30-years-long blip -- in the larger cycle of global warming, which postulates that temperatures will rise rapidly over the coming years. At a U.N. conference in September, Latif said that changes in ocean currents known as the North Atlantic Oscillation could dominate over manmade global warming for the next few decades. Latif said the fluctuations in these currents could also be responsible for much of the rise in global temperatures seen over the past 30 years. The U.S. National Snow and Ice Data Center (NSICD) agrees that the cold temperatures are unusual, and that the world's oceans may play a part in temperatures on land. "Has ocean variability contributed to variations in surface temperature? Absolutely, no one's denying that," said Mark Serreze, senior research scientist with NSIDC. But the Center disagrees with Latif's conclusions, instead arguing that the cold snap is still another sign of global warming. "We are indeed starting to see the effects of the rise in greenhouse gases," he said. Many parts of the world have been suffering through record-setting snowfalls and arctic temperatures. The Midwest saw wind chills as low as 49 degrees below zero last week, while Europe saw snows so heavy that Eurostar train service and air travel were canceled across much of the continent. In Asia, Beijing was hit by its heaviest snowfall in 60 years. And as for the cold weather? "This is just the roll of the dice, the natural variability inherent to the system," explained Serreze. The Statue of Liberty, depicted frozen solid in the movie "The Day After Tomorrow." 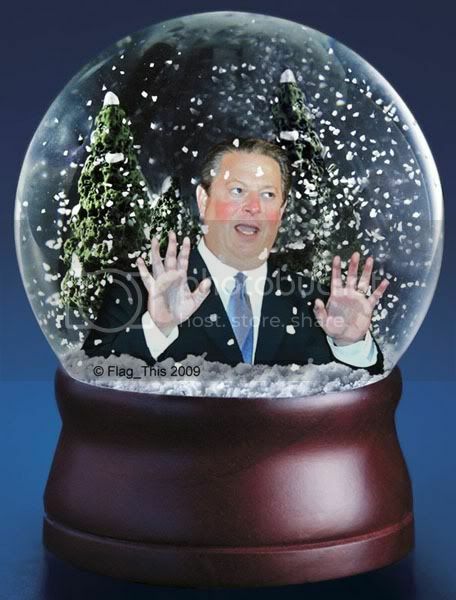 Many weather forecasters and scientists wonder whether a coming period of "global cooling" may be on the way. The hottest new trend in climate change may be global cooling, some researchers say. Contrary to the commonly held scientific conclusion that the Earth is getting warmer, Dr. Don Easterbrook, emeritus professor of geology at Western Washington University and author of more than 150 peer-reviewed papers, has unveiled evidence for his prediction that global cooling is coming soon. “Rather than global warming at a rate of 1 F per decade, records of past natural cycles indicate there may be global cooling for the first few decades of the 21st century to about 2030,” said Easterbrook, speaking on a scientific panel discussion with other climatologists. This, he says, will likely be followed by “global warming from about 2030 to 2060,” which will then be followed by another cooling spell from 2060 to 2090. Easterbrook spoke before a group of about 700 scientists and government officials at the fourth International Conference on Climate Change. The conference is presented annually in Chicago by the Heartland Institute, a conservative nonprofit think tank that actively questions the theory of man's role in global warming. Last year the Institute published Climate Change Reconsidered, a comprehensive reply to the United Nations' latest report on climate change. "Global warming is over -- at least for a few decades," Easterbrook told conference attendees. "However, the bad news is that global cooling is even more harmful to humans than global warming, and a cause for even greater concern." Easterbrook made several stunning claims about the effects of the coming cold. There will be twice as many people killed by extreme cold than by extreme heat, he predicted, and global food production will suffer because of the shorter, cooler growing seasons and bad weather during harvest seasons. But not everyone is breaking out the overcoat and mittens. “It's absurd to talk of global cooling when global heating is with us now and accelerating," said Dan Miller, managing director of the Roda Group, and an expert on climate change. "According to NASA, this past April was the hottest since temperature measurements began. And 2010 is on track to be the hottest year since temperature records began. “North America was relatively cool last year, but the Earth as a whole was much warmer than average,” he said. Data from the National Oceanic and Atmospheric Agency (NOAA) also points to a warming trend. The agency recently reported that global land and ocean surface temperatures for the first four months of 2010 were the warmest it had on record. Easterbrook, one of 75 climate and policy experts presenting at the conference, uncovered sudden climate fluctuations of warming and cooling -- all of which occurred before 1945, when carbon dioxide levels began to rise sharply -- through geologic evidence. Ten big climate changes occurred over the past 15,000 years, and another 60 smaller changes occurred in the past 5,000 years. Based on new analysis of ice cores from Greenland to Antarctica, Easterbrook said global temperatures rose and fell from 9 to 15 degrees in a century or less -- swings that he said were "astonishing." In addition, he explained that energy consumption will rise -- and consumer prices will rise along with it -- and political and social instability could result as the world population grows 50 percent in the next 40 years while food and energy demand soars. Another presenter at the conference, James M. Taylor, an environmental policy expert and a fellow at the Heartland Institute, said that global cooling is already happening. Based on figures provided by the Rutgers University Global Snow Lab, he noted that snow records from the last 10 years exceeded the records set in the 1960s and 1970s. A sign of global cooling? This past “decade set a record for largest average global snow extent,” Taylor said. The above two articles are older news by now, yet no one seems to be taken by the option that the planet is experiencing Global Cooling as the real outcome of higher CO2 in the atmosphere. Well - measuring by the winter experience in the northern hemisphere at present - there seems to be something amiss with the "Warming" part of the Gorey Story!!! Living in Africa, we are still sleeping under winter sheets in the middle of summer! Never has that been the case in my living memory here local! I personally agree with the above assesments and will be stocking up on fuel for my fire places here on the farm!!! Yep, Sky, I believe we are heading for a global cooling period as well - maybe even a mini-ice age. Thanks for posting the two articles. Last winter we had snow in Houston, TX in December. We've had a cooler than normal December this year. Right now we are sitting at 68 degrees F after a lot of rain yesterday. Rain we sorely needed as my state is still suffering from drought conditions. We are headed for a rainy, cold New Year's if the weather forecasts are correct. Typical weather for us this time of year is 2-3 days of cool weather followed by 3-4 days of warmer weather. We normally have a period of 2-3 weeks in January of "Indian Summer" where the temps rise to the mid-70's. That didn't happen last winter AT ALL! We had seriously cold weather here for 3 months. We also have a wet winter with rain. As I stated above, my state is still experiencing drought conditions. The rain we experienced yesterday was from a tropical system that formed just off the coast and moved north. The jet stream remains far north of us so we are not receiving the precipitation we should. This is the third year we've seen this - thus the drought. 2011 should be an interesting year to say the least. Over Here is Australia I SWEAR the seasons have FLIPPED over FREEZING cold summers even colder winters. FROZEN ice particles were on my roof last winter they have lead to MILDEW that we had to get professionally cleaned off $495 that's a LOT of money when you don't have much. Besides these stable isotopes, a number of short-lived (i.e., radioactive) artificial isotopes of oxygen are known. The longest living of the non-stable isotopes is 15 Oxy, which has atomic mass 15.0030656 u and has a half-life of 122.24 seconds. Comparing imagery of January arctic sea ice from 2009 to 2011 sourced from the U.S. Navy Polar Ice Prediction System, it appears as though the ice sheet has thickened substantially. That is, the arctic ice during January 2009 compared to January 2010 compared to January 2011, all purposefully compared during the same month of each year. This observation is looking at ice thickness – not surface area – although some retreat of 1 meter ice can be seen in the Labrador Sea. Up to 500,000 square miles of the arctic sea region may have thickened from approximately 5 feet thick during January 2009 to approximately 10 feet thick during January 2011. Superstorms can also cause certain societies, cultures or whole countries to collapse. Others may go to war with each other. Now "it" is here: an unstoppable magnetic pole shift that has sped up and is causing life-threatening havoc with the world's weather. Forget about global warming—man-made or natural—what drives planetary weather patterns is the climate and what drives the climate is the sun's magnetosphere and its electromagnetic interaction with a planet's own magnetic field. When the field shifts, when it fluctuates, when it goes into flux and begins to become unstable anything can happen. And what normally happens is that all hell breaks loose. Magnetic polar shifts have occurred many times in Earth's history. It's happening again now to every planet in the solar system including Earth. The magnetic field drives weather to a significant degree and when that field starts migrating superstorms start erupting. The first evidence we have that the dangerous superstorm cycle has started is the devastating series of storms that pounded the UK during late 2010. On the heels of the lashing the British Isles sustained, monster storms began to lash North America. The latest superstorm—as of this writing—is a monster over the U.S. that stretched across 2,000 miles affecting more than 150 million people. Yet even as that storm wreaked havoc across the Western, Southern, Midwestern and Northeastern states, another superstorm broke out in the Pacific and closed in on Australia. The southern continent had already dealt with the disaster of historic superstorm flooding from rains that dropped as much as several feet in a matter of hours. Tens of thousands of homes were damaged or destroyed. After the deluge tiger sharks were spotted swimming between houses in what was once a quiet suburban neighborhood. Shocked authorities now numbly concede that much of the water may never dissipate and have wearily resigned themselves to the possibility that region will now contain a new inland sea. But then only a handful of weeks later another superstorm—the megamonster cyclone Yasi—struck northeastern Australia. The damage it left in its wake is being called by rescue workers a war zone. The incredible superstorm packed winds near 190mph. Although labeled as a category-5 cyclone, it was theoretically a category-6. The reason for that is storms with winds of 155mph are considered category-5, yet Yasi was almost 22 percent stronger than that. Yet Yasi may only be a foretaste of future superstorms. Some climate researchers, monitoring the rapidly shifting magnetic field, are predicting superstorms in the future with winds as high as 300 to 400mph. Such storms would totally destroy anything they came into contact with on land. The possibility more storms like Yasi or worse will wreak havoc on our civilization and resources is found in the complicated electromagnetic relationship between the sun and Earth. The synergistic tug-of-war has been compared by some to an intricately constructed cat's cradle. And it's in a constant state of flux. The sun's dynamic, ever-changing electric magnetosphere interfaces with the Earth's own magnetic field affecting, to a degree, the Earth's rotation, precessional wobble, dynamics of the planet's core, its ocean currents and—above all else—the weather. The Earth's northern magnetic pole was moving towards Russia at a rate of about five miles annually. That progression to the East had been happening for decades. Suddenly, in the past decade the rate sped up. Now the magnetic pole is shifting East at a rate of 40 miles annually, an increase of 800 percent. And it continues to accelerate. Recently, as the magnetic field fluctuates, NASA has discovered "cracks" in it. This is worrisome as it significantly affects the ionosphere, troposphere wind patterns, and atmospheric moisture. All three things have an effect on the weather. Worse, what shields the planet from cancer-causing radiation is the magnetic field. It acts as a shield deflecting harmful ultra-violet, X-rays and other life-threatening radiation from bathing the surface of the Earth. With the field weakening and cracks emerging, the death rate from cancer could skyrocket and mutations of DNA can become rampant. Another federal agency, NOAA, issued a report caused a flurry of panic when they predicted that mammoth superstorms in the future could wipe out most of California. The NOAA scientists said it's a plausible scenario and would be driven by an "atmospheric river" moving water at the same rate as 50 Mississippi rivers flowing into the Gulf of Mexico. "There is, however, a growing body of evidence that the Earth's magnetic field is about to disappear, at least for a while. The geological record shows that it flips from time to time, with the south pole becoming the north, and vice versa. On average, such reversals take place every 500,000 years, but there is no discernible pattern. Flips have happened as close together as 50,000 years, though the last one was 780,000 years ago. But, as discussed at the Greenland Space Science Symposium, held in Kangerlussuaq this week, the signs are that another flip is coming soon." Discussing the magnetic polar shift and the impact on weather, the scholarly paper "Weather and the Earth's magnetic field" was published in the journal Nature. Scientists too are very concerned about the increasing danger of superstorms and the impact on humanity. Superstorms will not only damage agriculture across the planet leading to famines and mass starvation, they will also change coastlines, destroy cities and create tens of millions of homeless. A Danish study published in the scientific journal Geology, found strong correlation between climate change, weather patterns and the magnetic field. "The earth's climate has been significantly affected by the planet's magnetic field, according to a Danish study published Monday that could challenge the notion that human emissions are responsible for global warming. "'Our results show a strong correlation between the strength of the earth's magnetic field and the amount of precipitation in the tropics,' one of the two Danish geophysicists behind the study, Mads Faurschou Knudsen of the geology department at Aarhus University in western Denmark, told the Videnskab journal. "He and his colleague Peter Riisager, of the Geological Survey of Denmark and Greenland (GEUS), compared a reconstruction of the prehistoric magnetic field 5,000 years ago based on data drawn from stalagmites and stalactites found in China and Oman." In the scientific paper "Midday magnetopause shifts earthward of geosynchronous orbit during geomagnetic superstorms with Dst = -300 nT" the magnetic intensity of solar storms impacting Earth can intensify the effects of the polar shift and also speed up the frequency of the emerging superstorms. According to some geologists and scientists, we have left the last interglacial period behind us. Those periods are lengths of time—about 11,500 years—between major Ice Ages. One of the most stunning signs of the approaching Ice Age is what's happened to the world's precessional wobble. As explained in the geology and space science website earthchangesmedia.com, "The Chandler wobble was first discovered back in 1891 by Seth Carlo Chandler an American astronomer. The effect causes the Earth's poles to move in an irregular circle of 3 to 15 meters in diameter in an oscillation. The Earth's Wobble has a 7-year cycle which produces two extremes, a small spiraling wobble circle and a large spiraling wobble circle, about 3.5 years apart. "The Earth was in October 2005 moving into the small spiraling circle (the MIN phase of the wobble), which should have slowly unfolded during 2006 and the first few months of 2007. (Each spiraling circle takes about 14 months). But suddenly at the beginning of November 2005, the track of the location of the spin axis veered at a very sharp right angle to its circling motion. "The track of the spin axis began to slow down and by about January 8, 2006, it ceased nearly all relative motion on the x and y coordinates which are used to define the daily changing location of the spin axis." And the Earth stopped wobbling—exactly as predicted as another strong sign of an imminent Ice Age. So, the start of a new Ice Age is marked by a magnetic pole reversal, increased volcanic activity, larger and more frequent earthquakes, tsunamis, colder winters, superstorms and the halting of the Earth's precessional wobble. Unfortunately, all of those conditions are being met. YEEEESSSS!! Now maybe I CAN HAVE A WHITE CHRISTMAS!! Be careful what you wish for fr33k - snow in summer??? The heat of my house is it's worse then a blast furnace. A widespread drought in the Amazon rainforest last year caused the "lungs of the world" to produce more carbon dioxide than they absorbed, potentially leading to a dangerous acceleration of global warming. Scientists have calculated that the 2010 drought was more intense than the "one-in-100-year" drought of 2005. They are predicting it will result in some eight billion tonnes of carbon dioxide being expelled from the Amazon rainforest, which is more than the total annual carbon emissions of the United States. For the second time in less than a decade, the earth's greatest rainforest released more carbon dioxide than it absorbed because many of its trees dried out and died. Scientists believe that the highly unusual nature of the two droughts, which occurred in the space of just five years, may be the result of higher sea-surface temperatures in the tropical Atlantic, which could also be influenced by global warming caused by the release of man-made emissions of carbon dioxide and other greenhouse gases. The Anglo-Brazilian team of researchers has emphasised that there is as yet no proof that the two highly unusual droughts in the Amazon are the direct result of rising carbon dioxide levels in the atmosphere, but the scientists have warned that the world is gambling with its future if it fails to curb fossil fuel emissions. This is all Goreypant's fault. His nobel prize was for creating a new currency!!!! The stolen permits would allow a company to pollute the atmosphere with almost half a million tonnes of carbon. Known as European Union Allowances (EUAs), they are distributed by the EU as part of its carbon trading scheme, set up to help the bloc of nations meet its Kyoto protocol targets. Major companies can emit only as much carbon dioxide as their allocated EUAs allow. If they want to emit more, they must buy spare carbon permits from others. The pilfered permits could thus enter a black market in permits. On Tuesday, a Prague-based carbon bank called Blackstone Global Ventures announced that someone had hacked into the Czech national carbon registry and transfered 475,000 EUAs from its account. Each EUA represents a tonne of carbon and the total value of the stolen permits was around €7 million. Blackstone acts as a broker, pooling EUAs from companies with spare permits and selling them to others that need extra to offset their own emissions. According to Point Carbon, an energy and carbon market news service, the thief swiftly transferred the stolen permits to a registry in Poland, then to others in Estonia and Lichtenstein, before they disappeared altogether. Reuters reported that other unnamed carbon account holders were also raided. The Czech thefts are negligible in the overall volume of trade in EUAs. But they are not the first. In November, 1.6 million EUAs disappeared from the carbon account of cement maker Holcim, held in the Romanian national carbon registry. And earlier this month, someone tried to hack into the Austrian registry. The string of thefts threatens to wreck confidence in the European market, according to Point Carbon's carbon market manager Kjersti Ulset. That could have wider repercussions: the European market is widely seen as a model for a future global market.